This is one of a set of twelve paintings that is undated, but evidence shows it to be a product of the Painting Academy in the early Qianlong reign (1736-1795). 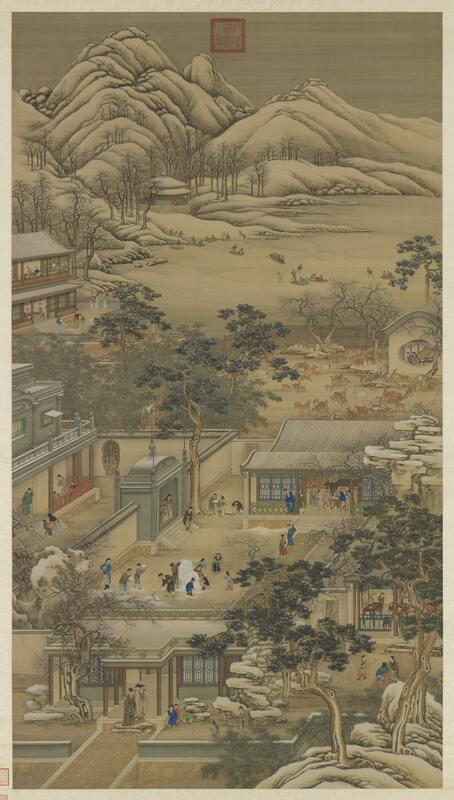 This scroll for the twelfth lunar month shows a landscape with snow and waters frozen in the depths of winter. Buildings recede realistically from the foreground into the distance, and various activities have been arranged in clusters, the details of which are rendered with precision. Some people stand at leisure, others warm themselves, and some skate on the ice. Children in courtyards play ball or with a shuttlecock and make a snow lion, fully engrossed in game. The painting is beautifully rendered in ink and colors, the architectural elements painstakingly portrayed with artistry that is exceptionally refined and delicate. A key work for studying the style of the Painting Academy in the early Qianlong reign, it is a masterpiece of Qing court painting.